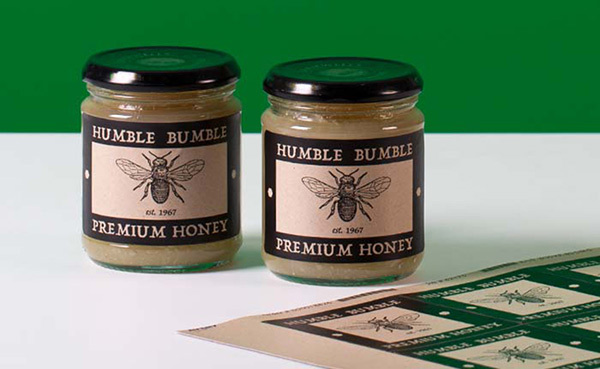 Do you need labels for natural, organic, handcrafted or vintage products? Take a look at our brown Kraft labels. We’ve noticed a strong trend in that direction recently, so to provide labels that help you achieve a more natural, homemade look and help the environment, we’ve introduced Light Brown Paper labels and stickers made from 100% recycled material. Whether you’re producing beer, honey, jams, preserves, wholefoods, wine or beauty products, these new sticky labels, also known as Brown Kraft labels, will give your products a distinctive natural, rustic and handmade style. To add a really personal touch, you can actually write on the Light Brown Paper material. Adding a handwritten name, greeting or message always makes a great impression. If you have a small business, handwritten additions can give you a great competitive advantage as this is not something your large competitors can easily do! Why use Brown Kraft Labels? By using Brown Kraft Labels for stickers, address labels and eCommerce fulfillment, as well as for the products themselves, you can create an Eco-friendly, rustic style and a highly professional look. The new light brown paper labels are made from premium materials and have a matt finish with protective varnish. They have permanent adhesive which makes these labels stick well to most surfaces, whether you’re using glass jars and bottles, plastic bottles or packaging, bags or boxes made from paper or cardboard. All the Avery WePrint label shapes are available in Light Brown Paper: rectangle, round, square oval plaque and straight oval. They’ve been designed to fit most containers and packaging, with rectangle, round and square labels in a wide range of sizes. Plaque and straight oval shaped labels are the ideal size for drinks bottles. You can print right to the edge using your own design or one of our templates. Using our online design tool, you can create your own design or upload finished artwork as a PDF. Follow this link to start creating your Light Brown Paper labels and stickers.